A pond restoration project aiming to benefit wildlife has achieved instant success, with a family of newts returning to the site. and Lover Green Association to restore the pond to benefit wildlife. The pond is situated in Lover in the north of the New Forest and had become overgrown in recent years, making it less attractive to wildlife. The project received nearly £2,000 in funding from the New Forest National Park Authority’s Sustainable Communities Fund and has been led by the Lover Green Association. This support has helped volunteers to successfully restore the pond to its former glory, with the aim of benefiting amphibians, wild flowers and insects. Professional contractors removed overhanging trees and undertook landscaping work to prepare the site. 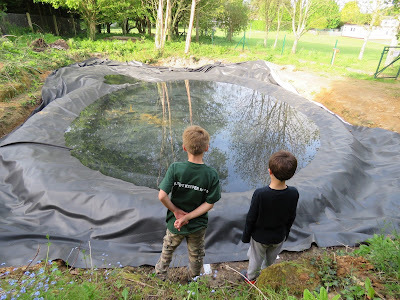 Around 30 volunteers then helped to shift tonnes of sand and put down the underlay and huge rubber liner, before filling the pond with water, all under the supervision of New Forest National Park Authority ranger Craig Daters. The benefit to local wildlife was immediately obvious, as the following day saw newts, water beetles and pond skaters making themselves at home in the pond. Craig Daters, New Forest National Park Authority ranger, said: ‘It’s been great helping the local community to restore this wildlife pond, and seeing it full of water makes all their hard work worthwhile. Mar Copp [correct], secretary to Lover Green Association, said: ‘Led by Craig we have shifted four tonnes of sand, profiled the pond, laid the underlay and liner and part filled it with water. We then left it to settle and were amazed to find that newts had moved in the very next day! Over £160,000 in grants were allocated by the SCF in the last financial year, bringing in an additional £176,000 of match funding to the National Park area from other sources. Provide sustainable transport options, including cycling facilities, to help enable visitors and residents to travel car-free in the New Forest and reduce the impact of traffic. Conserve the biodiversity of the National Park by supporting local landowners to deliver wildlife conservation improvements aimed at ensuring the landscape stays intact and is resilient against climate change. Before applying for a grant please contact the grants officer on 01590 646634 or email scf@newforestnpa.gov.uk.